We've talked to Olivia Huang, who is the current residency contact person at the YZ Creative Art Center, a newly set-up and in-progress artist residency in the countryside of the Shanxi province. China Residencies: How and when did the residency start? 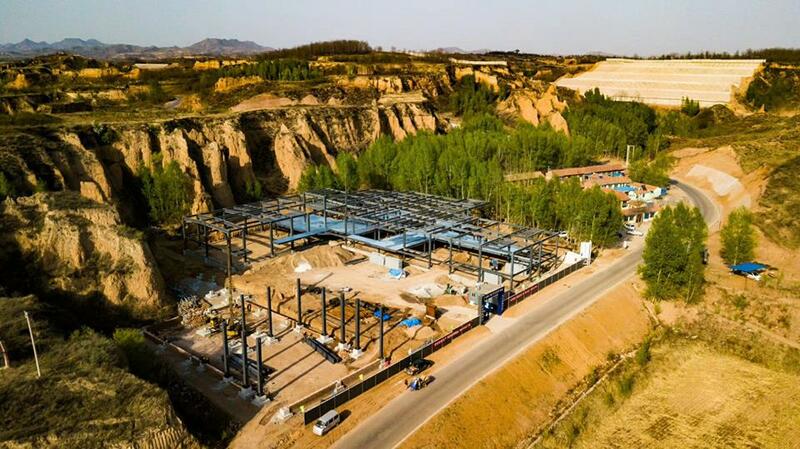 Olivia Huang: The YZ Creative Art Center is part of Yunzhu Lake Sports and Art Resort which is developed by Yunzhu lake scenic development Co. LTD. Yunzhu Lake Sports and Art Resort located at Yushe Country, Jinzhong City in the Shanxi Province in China. It’s a huge project which contains artist facilities, sports facilities, a hotel, catering possibilities and real estate. Our residency program started August 2018 and it was the first year we have artists participating in this residency program. Generally, we accept artists from all over the world from April 1st to December 1st every year. If they want to stay during the winter, we can also provide funds and support for their creation. OH: I am the principal and main contact of YZ Creative Art Center. Nancy Blair used to be our artistic director and I was her assistant at that time. I learned a lot from her. After we terminated the contract with her, I am in charge of residency artist recruitment and organization. OH: My major in college is law and had some experience in management. I graduated from Wuhan University. Deep inside my heart, I still had a fire so somehow I worked here. I worked in this art center for one and half a year. I helped to build every studios of this art center. I am still very young and learning all the new knowledge. We have a great team to run this residency project. 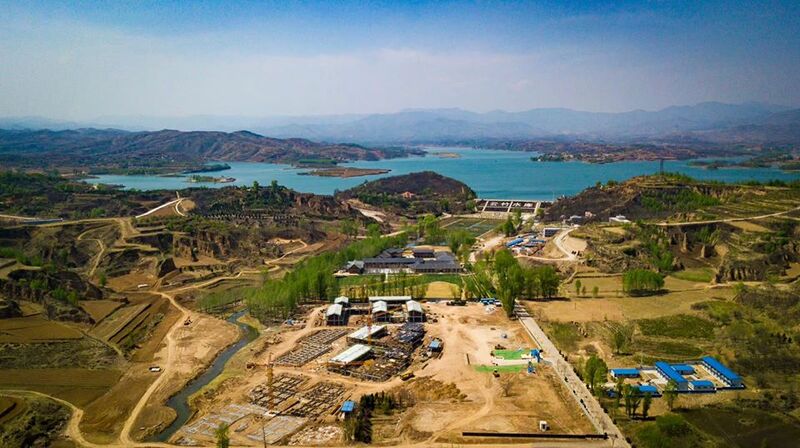 OH: Yunzhu Lake is a wonderful place with breathtaking landscape, a comfortable climate during summer, and an enormous size of the lake. With the support of local government, our company is developing this area. The characteristic of Yunzhu lake Sports and Art Resort is art and sports. The company provides funding, facilities, accommodations for the artists. We also want to create big work studios with world-class equipment. This place is huge. We can have plenty of working space and exhibition space. We can have a remote and quiet environment to live and create here. Also this community is economically not the strongest. We want to change their mind and life with art. OH: We have 7 people now in our department. The whole company has hundreds of staff. We will hire technicians, crafts and workers from July of 2018. The foreign technician we hired last year already went back. So this year we will hire new technicians. CR: What is each person responsible for? OH: Claudio Chen is the chief of our department who is in charge the creative aspect and the creative center. He is a professional architect who also designed our work studio. Olivia Huang, that’s me. I am in charge of artist recruitment, foreign affairs and supervising each art project. Tan Huang is a project manager, his work is management of Mega Art House and project manager of huge sculpture art case. We also have several artist assistants and mechanism experts. CR: What kinds of artists does your residency host? OH: Our residency program welcomes passionate, focused and self-motivated artists with at least three years' experience in their chosen field including the following: hot glass, warm glass, ceramics, mural design, mosaic arts, metal, wood, stone, mixed-media sculpture, site-specific sculpture, installation art, puppetry, music and the performing arts. Resident artists are selected on the strength and quality of their application. CR: For how long? What is the shortest and longest residence period you’ll consider? OH: The Artist Residency program is a minimum term of two months and as long as six months (or other arranged time) scheduled April 1 to December 1 each year. In 2019, our glass studio will be open from July. The other workshops will be open from May 1st. 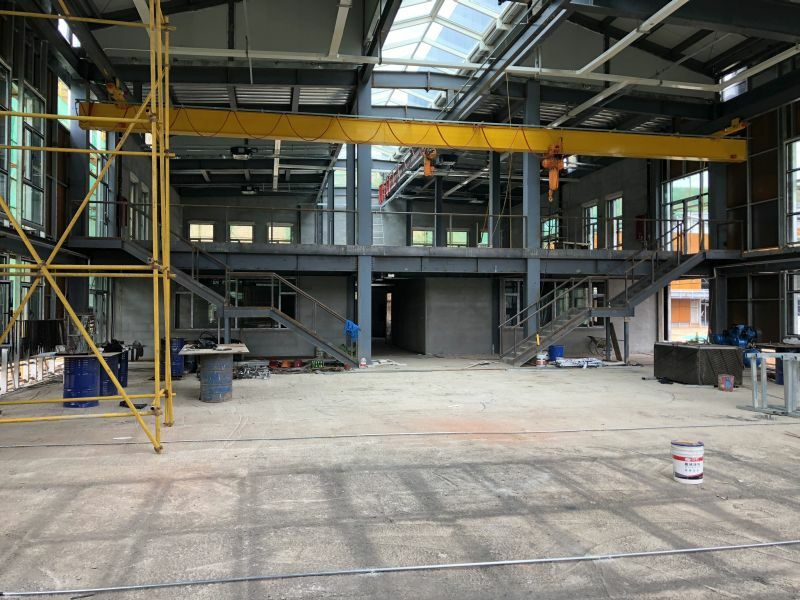 Overview of the YZ Creative Art Center during construction. OH: At least three years of experience in their chosen field. CR: How many artists in residence have you hosted so far? OH: We started our residency in 2018. Until now we have hosted 19 artists in 2018. OH: All the residence artist need to submit their proposal to YZ after they are invited. During their residency, they need to finish the proposal. The scope of this proposal depends on the materials and other situations. This proposal needs to be approved by both parties [the residency and the artist]. This piece of artwork will be donated for free to YZ to support the residency program. The basic principle is that this artwork can cover all the expense of residency. After artists finish the basic proposal, they can create other works. The other works will put in YZ gallery to sale. After sold out, the income is 50/50. Artists will get 50% of the price. Part of the other 50% will be donate to a foundation to support local school, low-income families and art community development. OH: Except for the residency basic proposal artwork, the other works they create here will be left in our gallery to sell. CR: What kind of artwork have the resident artists created? Can you give us an example or two of some of the most interesting projects by residents? OH: Our residency artists designed the North gate of the YZ resort. We already finished the basement of the huge sculpture and ordered the factory to manufacture it. We currently have the biggest fusing glass studio in China, even in Asia. We create fusing glass plates, window and mosaic painting. We also have a metal giant head sculpture [which is more than 7m high]. OH: We will recommend sightseeing tours for artists including the Shanxi Museum, Pingyao Ancient City, Wutai Mountain, Yungang Grottoes and so on. When the artists finish their creation, they are free to travel around in China. We will also cooperate with local high school and college to recruit volunteers to join in our art project. We will also cooperate with glass studio in universities. They can send their students to our studio to learn from our residency artists. CR: How do you promote your residency to attract local and international artist applications? OH: We are preparing a strategic marketing program with other organizations as well as using social media sites. We have joined the G.A.S and Sculpture as members and will attend the 2019G.A.S. conference. We place ads at Sculpture website, NCECA, G.A.S., Ceramic Monthly. We also created a facebook page. CR: Can you state a few more details about the other projects, such as the French sculpture project and the Museum of Glass? OH: About the French Sculpture, it is the big giant head combining giant face with open month and zebra. It is the entrance of Forest Theater. When it will be finished, we will add a metal slide coming out of its month. So children can enter the sculpture and use the slide to enter the Forest theater. It already finished partly. In 2019, the remaining half will be finished. Our museum of glass is the glass art center. Glass Art center is a part of a lakeside resortin Shanxi province, China. It focusses on offering world-class facilities to resident artists and visiting artists. There are four floors, each over 2800 square meters. On the first floor, We have a hotshop with two furnaces, two 18‘’ glory holes and one 24’’ glory hole and several annealing which all these equipment is from Canned Heat Glass. We bought our glass blowing pipes and punties, ladles and other tools from Olympic Color Rods. Our clear glass is from Cristalica, in German. We also have a coldshop with all input equipment ordered from HIS to make sure the quality is very good. The All Star Fusing Lab is on the second floor. It is all about fusing glass with 22 state of glass kilns which will offer artists the best studio to create their artwork. 6 paragon kilns, 6 Middle-sized and two XL kilns which we order from Canned Heat Glass. We also have a coldshop on the second floor. An artistic hotel with 29 rooms will be located on the third floor. Every room is painted and decorated in a different style. Each one will give guests a unique and exotic experience. 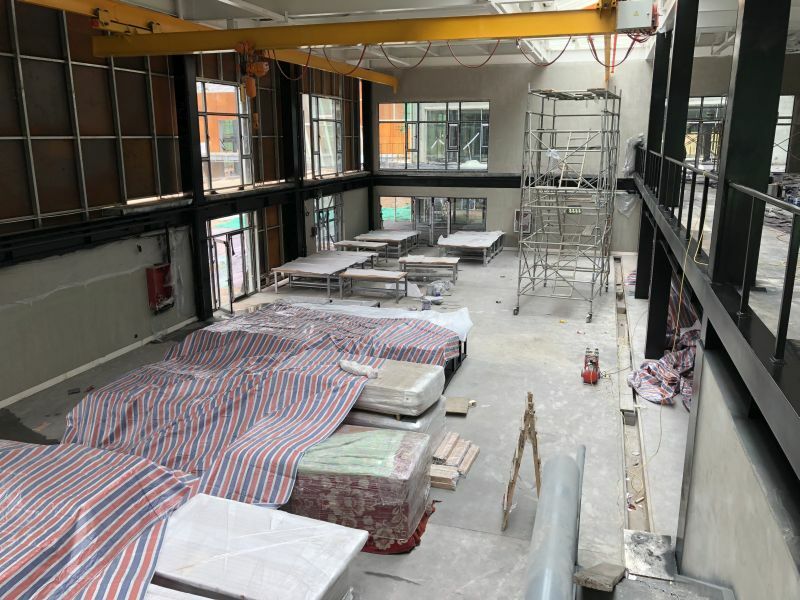 On the fourth floor, there will be dining and café facilities, a large conference center and various glass gallery spaces. Map of the Yunzhu lake. CR: Can you state a few more details about the other facilities, such as the Mega Art House and the Forest Theatre? OH: The Mega Art House is a large-scale studio with 4,000 square meters of ground floor work space, integrating various forms of art, composed of four major studios: metal, wood, ceramic and mixed-media studio, a complete sculpture design and fabrication center. It is the core for the birth of ideas and bringing them to realization. The workshops have 10 meter ceilings and room spanning gantry cranes. The Forest theatre is still under construction. It will have a main stage, bus stop, gift shop and the toilet. We haven’t bought any facilities yet. Pictured above: open air kiln room. Below: wood workshop in construction. CR: Your residency states to be a mixture between a resort lake and an artist residency. Could you tell us how strong the relation between the two is and how big a role the resort plays for the artists? OH: Our residency program will be a highlight of the resort. People can experience art here. They can join in the creation. They can wander around in the gallery. Artists can share their thoughts with tourists. OH: What we want to build here is a platform and art community. A platform or stage where artists can create what they always want to build and we will use our resource to promote these artworks in China. A community of artists from all over the world, living a happy and quiet life here. A place artists can experience Chinese life here. We have a big dream and we need more artists join in us to finish it. We are all part of it. The residency is project based. Artists will have an opportunity to design and complete projects for specific sites both for interior and exterior locations within the Yun Zhu community. Several options include interior and exterior murals and mosaics, lighting design, interior sculptures and wall installations in the Art Center and surrounding hotels and buildings, large outdoor sculptures, the performing arts theater and environmental installations. --Fully paid round trip airfare and visa processing fees. --Housing within the community with breakfast, lunch and dinner provided daily. --Private studio space with basic tools and materials. Residents are encouraged to bring special tools and materials. --A weekly stipend (determined by length of stay). --Opportunities for sightseeing and tours can be arranged. This interview was conducted by Xiaoyao Xu via e-mail for China Residencies in January 2019.